Original Article: "The Chicago Guide "
Chicago is easy to love. First, there’s the famous Midwestern charm, which can’t be overstated and seems genetically wired in its inhabitants. People are just really nice here. Then, of course, there are world class museums, parks, parks, parks everywhere you look, and so many great restaurants we’ve barely made a dent in our checklist. And every year, it just gets better. 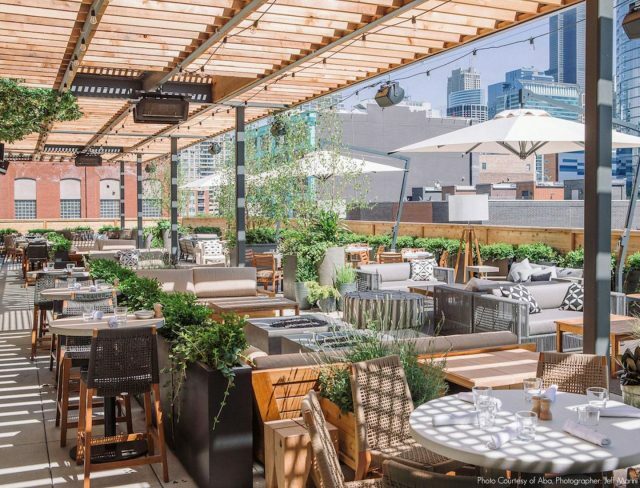 Formerly off-the-beaten path neighborhoods, like Logan Square and Bucktown, are now front-and-center when it comes to Chicago’s new crop of hip watering holes, while old school haunts, like The Peninsula (one of GP’s favorites), are getting fresh, modern makeovers. As much as we love sharing everything new, though, we’re also rediscovering cultural institutions, shops, and restaurants that deserve newfound attention. It’s this uniquely Chicago mix, after all, that makes this city so endlessly exciting. Hovering above Fulton Market in Ballast Point, Aba is the brand new, 4,000 square foot rooftop restaurant that’s turned into one of the city’s buzziest warm weather hangouts (though with several fireplaces spread throughout, it’ll likely remain a hot spot well beyond the summer season). The best way to tackle the Mediterranean-themed menu is by sharing everything, especially the small plates that includes five kinds of hummus (the avocado and fava bean is our favorite), and the red beet tzatziki with horseradish, dill, and finger limes. For dessert, the frozen Greek yogurt with olive oil and sea salt is simple, but so satisfying.